In 1992, Pepsi launched a new colorless soda called “Crystal Pepsi”. Consumers wanted purity and Pepsi believed a clear soda without color was the answer as it signified purity and health. Pepsi marketed the new formula as caffeine-free, pure alternative to the classic reddish brown normal colas. At the time, soda products were gathering a negative unhealthy image and consumers preferred more healthy alternatives like natural juices. Though initial sales were promising, consumers were not happy with the taste. Sales (around $470 million in the first year) were probably more out of curiosity than anything else was. It was similar in taste to the original Pepsi. Other colorless sodas like 7UP and Sprite had a citrus or lemon flavor. Customers were not sure how Crystal Pepsi was supposed to taste. Was it supposed to taste like Pepsi? Or not? If it was supposed to taste like original Pepsi, why was it more expensive? Pepsi had failed to position the product correctly. In the meantime, Coca-Cola launched its own transparent product called “TaB Clear” in December 1992. Coca-Cola positioned the product as sugar/calorie free ‘diet’ product. On the other hand, Crystal Pepsi had sugar content and failed to find the right fit in the diet category. After about a year since launch, Pepsi decided to halt the production of Crystal Pepsi. Pepsi began working on a new formula. In 1994, Pepsi launched another variant. This time it called the product just “Crystal” minus the Pepsi. However, Pepsi failed again and scrapped the idea of a clear cola. Even Coke failed with the TaB Clear. The clear soda market proved to be just a fad. Pepsi was successful with Diet Pepsi. 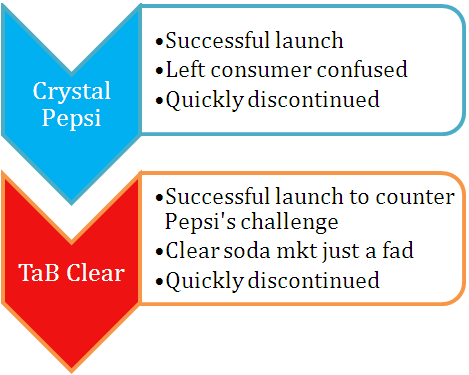 However, this success did not guarantee success with Crystal Pepsi. Even the re-launch as Crystal (minus the Pepsi in the name) was unsuccessful. Perhaps it had identified and was trying to fill a market gap, which was unnecessary.